American Bridal, online at AmericanBridal.com, is your ultimate source for wedding favors, bridal party gifts, invitations, and accessories. American Bridal provides stylish favors and gifts for your important day. Whether your special day is large in scale or an intimate gathering, American Bridal has the designs that best suit your needs. Get personalized bridal party gifts, groomsmen and bridesmaids gifts, unique shower favors, all at American Bridal. Do yourself a favor -- check RetailSteal.com first for American Bridal discounts, American Bridal coupon codes, and American Bridal promotions. American Bridal offers free shipping on US orders within the contiguous states over $125. Ship to any of the 50 US states, Puerto Rico, or over 200 countries internationally. Returns must be made within 60 days of purchase -- exclusions may apply. Get 25% off orders of $175 or more at American Bridal with the coupon code. Click link for savings. Use this coupon code at AmericanBridal.com and save 20% off your purchase of $150 or more and get free shipping. Act now and enjoy a 5% discount on your order from American Bridal. Use this coupon code to save. 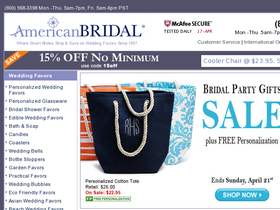 Enjoy a $15 discount on your entire order from American Bridal when you use this coupon code online. Use code on orders of $75+ to qualify. Spend $149 or more at American Bridal and get free shipping. Click link now. Check out the items on clearance at AmericanBridal.com for savings of up to 70%. Click link. Save up to 50% or more on the selection of stylish wedding favor boxes at AmericanBridal.com. Click link now to view, shop, and save. Take 50% off personalized favors at American Bridal. Click link to purchase. Get an additional 50% off all discontinued wedding items at American Bridal. Click link to see the selection. Save 20% on your American Bridal purchase when you enter this promotional code at checkout! Offer valid on purchases of $150 or more. Save 25% on your American Bridal purchase when you enter this promotional code at checkout! Offer valid on purchases of $75 or more. Save 15% on purchases of $50 or more from AmericanBridal online today. Click our link to shop and enter our coupon code at checkout to save. For a limited time only enjoy free shipping on your entire order from American Bridal when you spend $150 or more. Enjoy a 15% discount on your entire order from American Bridal when you use this limited time coupon code. Use code on orders of $125+ to qualify.